1Choose the Customers→Receive Payments command. 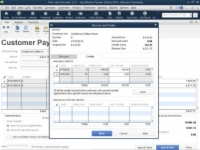 QuickBooks displays the Receive Payments window. 2Use the Received From box to identify the customer who’s paying you. Record the payment information in the Date, Amount, Reference #, Pmt. Method, and Card No. and Exp. Date boxes (if appropriate). 3Identify the invoice or invoices paid. 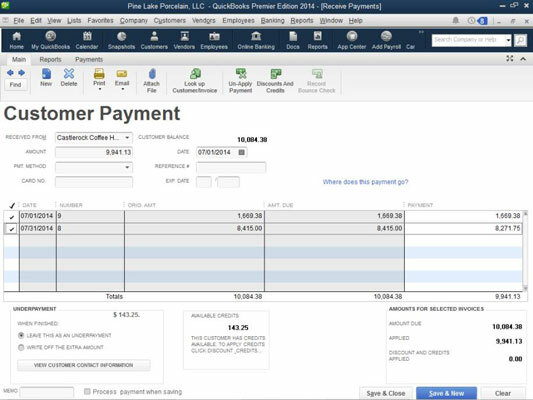 QuickBooks lists the open invoices for the customer in the columns area of the Receive Payments window. 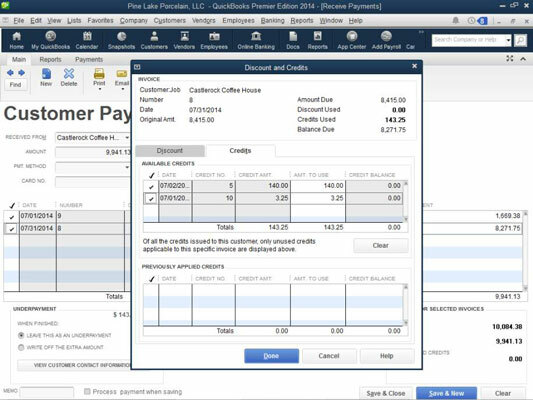 You can identify which invoices a customer payment pays by clicking the invoices that you see listed. 4To apply any credit memos to open invoices as you apply the payment, click the Discounts and Credits button. QuickBooks displays the Discount and Credits dialog box. 5To apply a credit to the selected invoices, click the Credits tab and then select the credit that you want to apply. Apply any discounts to the open invoices, and click Done. Discounts work like credits. In fact, you use the same dialog box. When you click Done, QuickBooks closes the Discount and Credits dialog box. 6If you've indicated that you'll use an undeposited funds account to batch payments, use the Deposit To box to select the account to which you want to deposit the check, or select the Undeposited Funds option if you want to batch the payments. 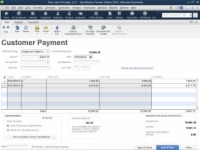 The Deposit To drop-down list appears in the Receive Payments window when, during the QuickBooks Setup interview, you indicate that you may want to bunch the payments that you later deposit. 7Click the Save & Close or Save & New button. The customer payment information is saved.